Kefalonia Greece Getting Around Kefalonia. 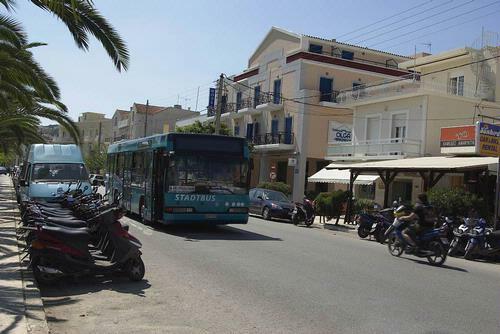 There is a frequent bus service in operation on Kefalonia. Sami 4 x daily. (hourly in high season). There is also a town service in Argostoli. To confirm the timetable call 26710 22281 or 22276. Taxi ranks can be found at the airport and in Argostoli. Taxis Are available in all the tourist areas of the island . Many of the drivers speak English. We suggest that you check the price before you start your journey. The rates are fixed, however, there may be an additional charge for luggage. Hiring a car is an excellent way of exploring Kefalonia. You can go where you like and stop wherever you please. There a number of Car Hire firms on the island and most have offices at the airport. There are also car hire offices in Argostoli, Lassi, Lourdas, Katelios, Skala, Poros, Sami and Svoronata.